Last week on Supergirl, it was revealed that Lena has been experimenting on Samantha in an attempt to rid her of her Reign World Killer persona. When the Reign gene is activated, it sends Samantha to another dimension, freeing Reign to continue her quest of killing and remaking the world. The third World Killer Pestilence was also revealed as she unleashes a virus that immobilizes people in National City. Pestilence and Purity then find out where Lena is keeping Samantha and break her out just as Supergirl, Mon-El, and J'onn arrive to try and stop them. After they defeat our heroes, Lena’s got some ‘splaing to do. The episode begins with Lena at the DEO seemingly being interrogated. Lena’s not really worried as she explains that she’s doing what she felt was right. The big problem comes when everyone asks her how she was able to keep Reign at bay. Lena reveals that she had some of Lex Luthor’s secret Kryptonite stash. This rubs Kara the wrong way as she’s been one of Lena’s steadfast supporters as many in National City always associated her with her brother and her mother, both supervillains. For her to keep such a secret, one that can actually kill Kara, is a step too far for her. Even when Lena finally fesses up to James, she’s taken aback. However, he’s a little more supportive of his girlfriend than everyone else. Meanwhile, the World Killer trio (hence the “Trinity” title) are taking their attack to the next level. Using some sort of unexplained magic, they have managed to block the sun. Being deprived of the sun, Kara starts to feel weak and will eventually die. While she falls unconscious, Kara is transported to the same alternate dimension that Samantha was transported to last week. For a brief moment, Kara runs into Samantha and Julia (Purity), who are slowly losing their minds as Reign and Purity are taking over permanently. Samantha can’t even remember her daughter’s name. Kara realizes that she will need to transport to this new dimensional place, revealed to be called Juru, and try to rescue the two of them. However, she will need help. Alex insists on going with Kara as she’s week, and Lena (despite them not trusting her) convinces them that she can help Samantha as she spent the most time with her. Brainiac-5 (still using the image inducing technology as actor Jesse Rath is probably tired of wearing makeup) creates technology to allow the three of them to go to Juru. 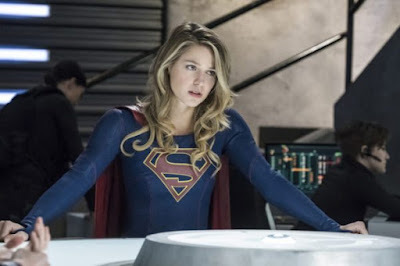 Before they go, Kara asks James to go to Lena’s office as Guardian and break in to confirm if Lena’s supply of Kryptonite was truly depleted as Lena told her it was. James is reluctant, but he realizes that it needs to be done. With Winn’s help, he breaks into her office. However, when it’s time to use Winn’s tech to break into her vault, James lies and says he broke into it and there was no Kryptonite. His feeling for her is very strong as he just can’t will himself to do it. Later on, James confesses this to Lena, where she reveals that the Kryptonite was not Lex’s but she managed to create Kryptonite. Kara, Alex, and Lena wake up in Juru where they run into weird Kryptonian ghosts before the eventually run into a scared Samantha and Julia. They plead with Samantha to go back to the real world so that she can reveal to them where the World Killers’ Fortress of “Sanditude” is. Samantha manages to hold it together and snap out of it and return back to the real world. Pestilence realizes that she’s not Reign anymore and attacks her. This causes Reign to come back quickly, but not before the DEO learn where the Fortress is. Brainiac-5 pulls everyone into the real world where they then fight against the three World Killers. 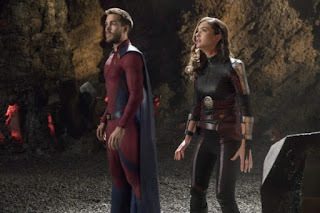 As Mon-El and Saturn Girl fight Pestilence, J’onn fight Purity, and Kara fights Reign. The fight is pretty even, but then our heroes start losing. Even Alex’s new gun doesn’t give them the upper hand. Alex and Kara plead with Purity (rather plead with Julia) to stand up against her evil persona. Julia manages to take over Purity and faces off against Pestilence. The two end up destroying each other. However, the World Killer spirits leave their dying bodies and then come into Reigns, meaning she now has the power of all three. Next week, with all World Killer powers, Reign goes on the attack, even on Samantha’s own daughter.